A couple months ago a traditional journalist from one of the more popular food magazines wrote an article expressing his opinion of blogs. Although he called out a couple of blogs that he enjoyed, I think that was more to appear to be balanced because most of the rest of the article was disdainful of food bloggers. I think that is too bad, as it seems that some traditional journalists feel the need to discredit what they think might threaten them. While blogs are blogs, they are neither inherently good or bad and, as with so many things in life, some people will find one blog amazingly interesting while others may not find anything of redeeming value in it. In general, blogs don’t hurt anyone, although I think bloggers have a responsibility to be ethical and double check information when reporting things as fact. And I think most bloggers, although there are exceptions, should not call their write-ups of restaurants "reviews" because what most of us do is eat at a place once, then tell you about that experience. A real reviewer will visit a place several times, under varying conditions before writing a "review". And we should be careful not to put our summaries into that same category. Having said all that, though, the thing that got me thinking (and much of the food blogging world up in arms) was the reporter’s remark about (and I’m not quoting) how he never wanted to see another grilled cheese sandwich again – or something like that. Basically saying he wasn’t interested in what anyone had for lunch on any day. 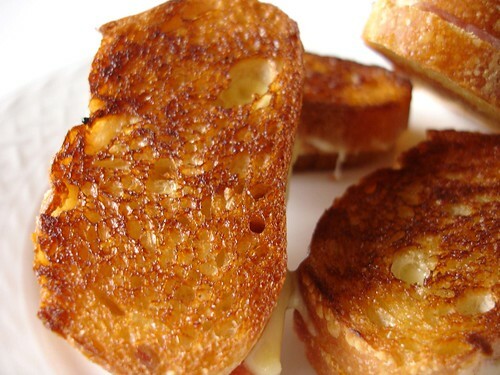 Well, many food bloggers then did just that, posted their grilled cheese sandwich photos. I didn’t participate because, while the guy has a right to his opinion and food bloggers have a right to theirs, I didn’t think the whole thing was worth responding to. But it made me think about some of the things I post and why I post them. And that was a very long way of getting to the point of this post! The photo at the top of the page, is of mini-grilled sandwiches. I had been kind of hankering for a grilled cheese sandwich when I realized that the only bread in the house was a baguette and a very small baguette, at that! At first I was discouraged but then decided to use that bread – an experiment to see how these would work as an appetizer! They were good! Just two or three bites each, they could be the perfect savory bite at cocktail time. For these particular sandwiches I used thinly sliced Gruyère cheese, a slice of soprasotta salami, a slice of tomato and one more slice of cheese so there would be "glue" on both sides. While grilling I placed a sheet of parchment and a heavy pan on top of them to really get the cheese-glue working. The second photo, was actually based on that same loaf of bread! :-) But this time, I simply did a quick sauté of beautiful Mexican shrimp in olive oil and garlic. 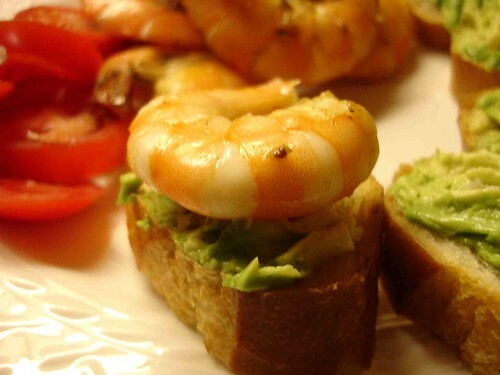 I toasted slices of the baguette;mashed a little ripe avocado on top of the bread; sprinkled some nice chunky salt on the avocado; added a peeled shrimp to the top of the stack and then drizzled a little fresh lime juice over the whole thing. The tomatoes you see in the photo were just a little side dish. 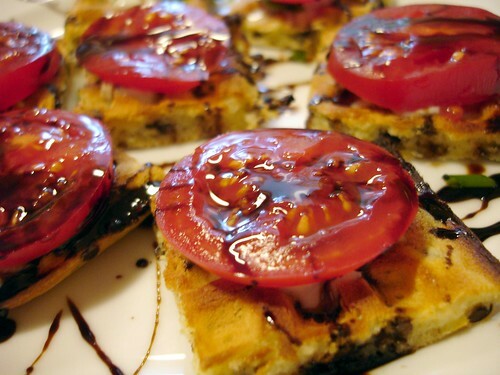 In the final photo, you’ll see how I used some of the leftover wild rice waffles from a recent brunch. After the brunch I had frozen a bunch of the waffles. On this day I defrosted a couple squares, toasted them in my oven until the were a bit crispy on the outside but still soft inside. I cut them into quarters and then topped them with a dollop of creme fraiche, some chopped green onion, a slice of tomato and then I drizzled the whole thing with a reduced balsamic vinegar that I’d made for another dish a few days prior. Bite-sized and perfect with a glass of wine. So I hope that looking at these photos and reading my little story encourages you to go see what you have laying around the house and put something together. And by the way – there are lots of things I try that don’t make it to the blog. Maybe the taste was okay but nothing special, maybe it wasn’t even really okay… maybe it tasted great but didn’t look all that appetizing. The point is you have some successes and some, umm, experiments but when you have one that really works it is so great!